(Natural News) A 18-year-old girl who had cold sores since she was five said that the only treatment that effectively worked to manage her sores is a licorice balm. Indigo Faulkner tried a lot of topical treatments and even anti-viral medications prescribed by her doctor to treat her cold sores, but all of these failed. She had suffered from an outbreak of painful, fluid-filled, blister-like sores on her lips every six to eight weeks, which consequently lowered her self-esteem, made her feel anxious, and antisocial. The effectiveness of licorice is proven by science. In fact, researchers from Hamadan University of Medical Science in Iran found that licorice root can weaken the cold sore virus which lies dormant in the skin between outbreaks. In the study, they assessed the effects of licorice root on a virus called Herpes Simplex Virus 1 (HSV-1), which causes cold sores. The virus stays in the skin forever, which is why cold sores come back. Cold sores begin to heal within 10 days. However, they may spread and be irritating or painful during the healing process. Moreover, cold sores are contagious, especially when the blisters burst. Thus, close direct contact must be avoided. Signs and symptoms of a cold sore include blisters on the tongue or mouth, mouth or tongue pain, lip swelling, possible swallowing difficulties, sore throat, swollen glands, high body temperature, dehydration, nausea, and headaches. The research team aimed to determine the efficacy and the effect of of the licorice root extract treatment on Vero cells infected with HSV-1. They incubated the Vero cells after administering different concentrations of aqueous extracts of licorice. Then, they incubated the cells during different time courses. Moreover, they performed cytotoxicity assay to determine the 50 percent tissue culture infectious dose, as well as incubated HSV-1 with licorice root extract before the viral infection. Licorice refers to the root of the plant Glycyrrhiza glabra, which is native to Europe and Asia. Over the years, it has been used by the early Egyptians and Chinese for its various medicinal uses. Aside from treating cold sores, licorice root is also used for treating eczema because of its antibacterial properties. Another medicinal use of licorice root is it soothes the stomach. Licorice root is usually used to soothe gastrointestinal problems, such as food poisoning, stomach ulcers, and heartburn. Its extract can accelerate the repair of the stomach lining and bring back balance because of its anti-inflammatory and immune-boosting properties. Moreover, licorice root is also recommended for treating respiratory problems because it can help increase the production of healthy mucus, which in turn keeps the respiratory system functioning. In addition, supplements of licorice root can provide the adrenal gland some relief and stimulate it, especially during stress. The adrenal gland is overworked during stress because it constantly produces adrenaline and cortisol. 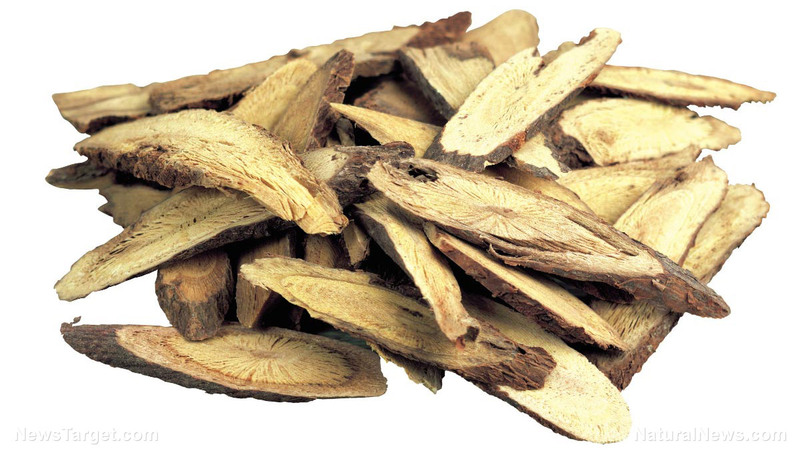 Furthermore, some studies suggest that licorice root can possibly help in treating breast and prostate cancers. Since it is also antibacterial, some health practitioners suggest applying licorice to teeth to get rid of tooth decay. Read more stories on other natural medicines like licorice root or Glycyrrhiza glabra at NaturalCures.news.